Embassy House excerpt: An eyewitness account of the Benghazi attack that killed Christopher Stevens and three other Americans. 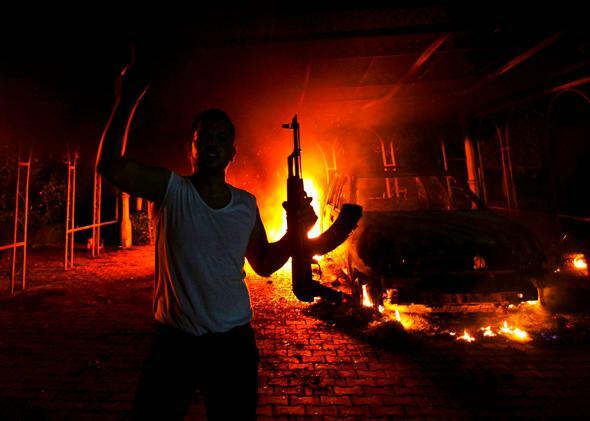 An eyewitness account of the Benghazi siege that killed U.S. Ambassador Christopher Stevens and three other Americans. Update, Nov. 8, 2013: On Oct. 29, 2013, Slate published this excerpt of Sgt. Morgan Jones and Damien Lewis’ book The Embassy House. The Washington Post subsequently reported that Morgan Jones, whose real name is Dylan Davies, originally stated in an after-action report that he did not reach Ambassador Christopher Stevens’ compound the night of the Benghazi siege, contradicting his book’s account. On Nov. 7, the New York Times reported that Davies had given a similar account to FBI investigators that also contradicts the book. Simon & Schuster has announced it is suspending publication of the book. Based on these revelations and Davies’ failure to respond to the new allegations, CBS News issued an apology on Nov. 8 for its 60 Minutes broadcast of a story based on the book. Slate can likewise no longer stand behind the veracity of Davies’ account. The U.S. Consulate in Benghazi is seen in flames during the attack by an armed group, Sept. 11, 2012. This article is excerpted from Sgt. Morgan Jones and Damien Lewis’ book The Embassy House: The Explosive Eyewitness Account of the Libyan Embassy Siege by the Soldier Who Was There. In the months following the Benghazi Embassy siege I learned the fuller picture of what happened during that fateful night, both at the Mission itself and at the Annex, which was only a short drive away from the Mission. Tensions were running high that evening, because of a recce mission that a Libyan policeman—or more likely a bad guy posing as a policeman—had carried out that morning. We’d caught him taking photos of the Mission’s front gate and grounds, and we feared it was in preparation for some kind of an attack. I had served at the Mission for six months as the security manager overseeing the Libyan guard force, one employed by Blue Mountain Group, a British private security company. My role was to recruit, train, and oversee the guards, but due to my extensive experience of such security operations I also worked closely with the Americans stationed at the Mission, in an effort to improve its wider security. As we were all painfully aware, the defenses at the embassy were woefully inadequate, plus the city of Benghazi itself was becoming ever more dangerous, especially for Americans and/or their allies. As a result, the Benghazi Mission had become a place of fear for just about everyone stationed there, and especially on the day when we had what we suspected were recce photos taken of the Mission. Even Sean Smith, the IT guy who was only days into his posting, and whose mind I had recently tried to put at rest by telling him we’d never had any real trouble at the Mission—even he was fearful. A couple of hours prior to the attack Sean was online with his friends, and one of them emailed, “see you tomorrow.” Sean replied: “If I’m still here tomorrow; our security manager caught a guy taking photos of the Embassy front gate; so I hope I make it through the night.” It was ominous, his foreboding of the imminent attack. Sean was a big online computer gamer, and he was actually online as the attack began. He typed in real time: “I hear shots; we’re being attacked … I hope I will be able to speak to you again tomorrow.” Of course he never would, because Sean would die in the assault that was even then unfolding. Shortly after nightfall 50 gunmen from the Shariah Brigade—a Libyan militia tied to al-Qaida—rushed the Mission, and were able to gain access via the pedestrian entrance set to one side of the main gate. They did so by threatening the Blue Mountain guards with assault rifles and RPGs. Basically, the guards—who were unarmed and defenseless, because the State Department contract dictated that they be unarmed and defenseless—were ordered to open the side gate or else be killed. The one thing my unarmed guard force did do was raise the alarm—either via their radios or by pressing the duck-and-cover alarm (it remains unclear which occurred). Alerted to an attack, Alex, the lead regional security officer (RSO), could see via the CCTV monitors in the Tactical Operations Center (TOC) what was unfolding. Scores of heavily armed gunmen were streaming into the darkened compound. Ambassador Stevens had retired to the VIP Villa approximately 30 minutes before the attack, having finished an evening meeting with the Turkish ambassador to Libya. At the time of the attack Stevens was alone in the VIP Villa, apart from Sean, who was also billeted there, and one of the ambassador’s close protection guys, who was watching a video in the villa’s common area. The two RSOs, Dave and Scotty, were relaxing at the rear of the VIP Villa, in the outside seating area, along with the second of the ambassador’s close protection (CP) guys. Dave and Scotty heard explosions and gunfire coming from the front entrance, and a warning of the attack was radioed through to them by the Blue Mountain guard force. Realizing they were under armed attack, the three of them raced to their respective positions, exactly as had been planned in the event of such an attack. Scotty headed into the VIP Villa to secure the ambassador and Sean. He grabbed his weaponry—a combat shotgun, M4 assault rifle, plus a SIG Sauer pistol—and got the ambassador and Sean to don their body armor. He got them into the safe area and locked and secured it, with the three of them inside. That done, Scotty radioed through a confirmation of their whereabouts to Alex in the TOC. He then took up a defensive position inside the safe area, with a view through the steel gates covering any route of ingress of any potential enemy. The dozen-strong CIA security team at the Annex—consisting of ex–Special Forces (SEALs and Delta Force) and other elite operators—were the cavalry that were called to the Mission’s aid. That call was made at approximately 9:40 p.m.—so barely minutes after the attack had been launched—and similar calls were put through to the Diplomatic Security team headquarters, in Washington, alerting them to the fact that the Benghazi Mission was under attack. Dave and the other CP guy sprinted toward the TOC and the nearby Villa B to arm themselves. Dave was that night’s “TOC officer”—meaning he would sleep at and man the TOC—and his weaponry was located there. Dave linked up with Alex in the TOC, at which point the imperative was to break out the M4 carbines, shotguns, and ammo held there and don their body armor. Before doing so, they locked and barred the door to the TOC, and they could already hear the attackers trying to break in. The ambassador’s two CP guys were now in Villa B, pulling on body armor and readying weaponry. That done, they attempted to return to the VIP Villa, where the ambassador was locked into the safe area. As they turned onto the dirt track leading to the VIP Villa they came up against a mass of the Shariah Brigade fighters. In the ensuing firefight they quickly realized how heavily they were outnumbered and outgunned. They were forced back into Villa B, together with one of my guard force. They barricaded themselves into a back room and took up defensive positions. But by now the Shariah fighters had blown up the guardroom at the main gate and torched the QRF Villa which lay adjacent to the main gate and housed the Quick Reaction Force made up of a local Libyan militia. They captured two of my guard force and made them kneel inside the front gate, where they beat them and carried out mock executions. Guns were put to the guards’ heads, and triggers pulled on empty chambers—hence initial reports that I heard that my guards had been shot in the head and executed. Having made it clear they were “only here to kill Americans,” the attackers shot one of the guards in both kneecaps before turning to their main task—the hunt. They spread out through the wider compound searching for American targets. At around 9:50 p.m.—10 minutes after the attack began—Ambassador Stevens managed to place a call through to Tripoli using a cellphone. He managed to speak to the U.S. Embassy in Tripoli, his warning triggering the mustering of a small, ad hoc Quick Reaction Force (QRF), which was apparently all the Tripoli Embassy could manage due to the lack of available airframes to fly them to Benghazi. The Shariah Brigade fighters converged on the VIP Villa and broke into its interior. Unable to penetrate the steel security gate barring off the safe area, they started banging on it and yelling violently and firing. Scotty made the decision not to return fire, in an effort to hide the fact that he, the ambassador, and Sean were locked inside. He warned the ambassador and Sean to prepare for explosions and blasts when the Shariah fighters tried to break their way through the security barrier. Instead the Shariah fighters decided to try to burn the occupants out. They fetched cans of diesel fuel that were going to be used to power the Mission’s generators—ones that were not yet in service—and were stored near the QRF Villa. They torched the Mission’s armored SUVs parked by the QRF Villa before turning back to the VIP Villa itself. They went inside and threw the diesel around the villa’s interior, soaking furniture with the fuel. They then set the building on fire. As the fire took hold, the villa’s interior filled with thick black diesel smoke and the fumes thrown off by the burning furniture. Scotty first realized the villa was on fire when the light became dim, as the smoke seeped into the safe area. Realizing that the villa had been firebombed, he got the ambassador and Sean to retreat into a room at the rear—a bathroom. The three men got down on their hands and knees in an effort to avoid the thick black diesel smoke that was billowing into the safe area. Scotty tried to seal the bathroom door using wet towels, but the smoke kept seeping inside. He next tried opening the bathroom window, in an effort to ventilate the place, for all three of them were having problems breathing and visibility was down to near zero. But opening the window only served to create a through-flow of air in the wrong direction, drawing more smoke into the small, cramped room, which in turn made it even more difficult to breathe. The toxic fumes were building to intolerable and potentially deadly levels. Scotty realized they couldn’t last in there, and he yelled for the others to follow him as he made his way onto the roof of the villa. This involved moving into an adjacent bedroom, from where a window opened onto a patio and from there onto the roof. Crawling on his hands and knees and unable to see properly, he yelled for the others to follow. He showed them the way, banging on the floor to guide the ambassador and Sean to the exit. Scotty managed to make the window, open the security grille, and clamber outside, collapsing onto the small patio area. As soon as he was visible to the Shariah fighters Scotty came under fire. Realizing that neither the ambassador nor Sean was with him, Scotty went back into the smoke-filled villa to search for them. He did this several times, each time trying to take in fresh air from outside to enable him to continue the search, and still taking fire from the enemy. But on each attempt the thick smoke and the boiling heat forced him to retreat outside in an effort to recover. He kept doing this until he was close to being rendered unconscious, at which stage he staggered up onto the villa roof and radioed for help. In the TOC, Dave and Alex heard his radio call, but Scotty was so badly affected by the smoke that he was almost unintelligible. They finally realized what he was trying to tell them: that he didn’t have the ambassador or Sean with him, and that they were trapped in the Villa’s smoke-filled interior. Outside the TOC the Shariah fighters had tried to burn the SUVs parked there, but their jerry cans of diesel were empty. They also tried to break into Villa B, where the ambassador’s two CP guys and the Libyan guard were holed up, but failed to do so. Dave and Alex had watched all of this on CCTV. Leaving Alex in the TOC to man communications, Dave managed to fight his way across to the nearby Villa B—using a smoke grenade to cover his movements—and he reunited himself with the two CP guys. Together the three of them made their second foray into the grounds of the embassy, trying to get from the TOC to the VIP Villa. Driven back by ferocious enemy fire, they grabbed an armored SUV parked outside the TOC and used it to break through the hordes of fighters now occupying the compound. Dave and the two CP guys made it to the VIP Villa, whereupon they debussed and headed for the roof to put down fire onto the enemy. There they discovered Scotty, who was vomiting from severe smoke inhalation and in danger of losing consciousness. One of Scotty’s last acts had been to smash open a skylight in the VIP Villa’s roof in an effort to ventilate the interior and help the ambassador and Sean trapped inside, but it didn’t appear to have had much of a positive effect. Dave and the CP guys took up positions on the villa roof, so they could put down aimed shots onto the scores of heavily armed Shariah fighters now converging on their position. This was the fallback defense plan if the compound itself was taken—the idea being to hold the VIP Villa long enough for reinforcements to arrive and break the siege, and drive off the attackers. But as Dave would make so clear in a cellphone call to me, they had little hope of any force getting to their aid in time, due to the massive numbers of enemy surging into the compound. All three of them—Dave and the ambassador’s two CP guys— made repeated forays into the interior of the villa, using the same route through the window that Scotty had employed, searching for the ambassador and Sean. If anything, the conditions inside were even worse. They were forced to snake along on their bellies, to try to keep below the thick and suffocating smoke. In spite of their efforts all they achieved was to make themselves violently sick, and all three ended up on the verge of losing consciousness. While the Americans at the Mission had been fighting this desperate battle, I was doing all in my power to make good on my promise—to stand with them if the bad guys attacked. I was billeted away from the Mission compound, but just as soon as I’d got the warning call from my guards, I’d got my driver, Massoud, to head over to my place with weapons. We’d set out across the city, intent on launching a one-man rescue mission—for I doubted very much if Massoud was coming with me, and in any case I needed him to stay with the vehicle. If I did manage to rescue the trapped Americans, we’d need a driver and set of wheels to make our getaway. Meanwhile, at the nearby Annex, the CIA’s head of security had heard explosions echoing from the direction of the Mission. According to some media reports the call for help from the Mission was initially denied by the Annex CIA chief of base (COB), though this is disputed by the CIA. Either way, a seven-man team led by ex–Navy SEAL Tyrone S. Woods assembled—grabbing weaponry, ammunition, and night vision equipment in preparation for leaving the Annex to go to the aid of those under siege at the Mission. Tyrone Woods was a member of the Annex’s Global Response Staff, former elite forces members contracted to provide security to CIA agents operating out of the Annex. Woods had served with the U.S. Navy’s SEAL Team Three and had won the Bronze Star with a Combat V for valorous duty in Iraq. He’d led 10 reconnaissance missions leading to the capture of 34 insurgents in the volatile Al Anbar Province of Iraq. He’d also completed multiple tours of Afghanistan during 20 years of service with the U.S. military. In 2007 he’d left the military and was working in the Annex as a Global Response Staff member, and he was hugely respected in that role. Ty Woods and his team were going to the Mission’s aid, with or without the COB’s blessing. It took 25 minutes from their first being alerted to the attack for the team from the Annex to be ready to go to the Mission’s rescue. It was just after 10:00 p.m. when they set out driving two armored Toyota Land Cruisers. There were six of them, as one operator had been left to man radios—a vital role. In the time it had taken them to prepare to leave they had tried to muster support from various pro-government militias in Benghazi—which in part accounts for the delay—but none seemed willing to come to their aid. It took that six-man team a good 25 minutes to drive the short distance to the Mission compound. This is largely because they would run into the same kind of resistance that Massoud and I would encounter—namely, scores of Shariah gunmen and their gun trucks, equipped with heavy weaponry. Roadblocks had been put in place to stop any relief force getting to the Mission, and—unlike Massoud and myself driving a local vehicle— the Annex team in their armored SUVs were highly distinctive from some distance away. At one point the Annex team stopped to try to convince militia members—most likely 17th February Militia, who were massed around the battleground—to join them in their efforts to retake the Mission. Those requests were denied by the militias, and the QRF team were forced to move ahead with no help and taking savage fire as they drew closer to the Mission compound. The sheer level of hostile fire that had engulfed the Mission was fearsome, but there was no way that Ty Woods and his fellows were turning aside from their tasking. At the same time, Massoud and I were converging on the battleground. After working there for so long I figured I knew of a secret route into the compound, and I was intent on launching my own rescue attempt. This was the start of a night of sheer hell. It was a night upon which Americans would die in the most horrific of ways, and for reasons that to this day both escape and enrage me. It was a night upon which I would fight my way into the besieged Benghazi Mission three times over, largely against orders, in an effort to find my American brothers-in-arms and to stand with them against the terrorist horde. It was a night on which I should have died many times over, along with my American buddies. This was the blackest of nights—one that would lead me to find the American ambassador to Libya lying dead and without a fellow American by his side. I’d discover him with a tiny cut to his forehead, but otherwise looking more or less unharmed—yet he had been murdered in the most inhuman of ways. In short, this was a night of criminal failure, of individual acts of unrivaled heroism, and of untold savagery and murderous intent on the part of America’s enemies. But when I first deployed to Benghazi, I had not the slightest inkling about the nightmare that was coming. Copyright © 2013 by Morgan Jones and Damien Lewis. From the forthcoming book The Embassy House by Sgt. Morgan Jones and Damien Lewis to be published by Threshold Editions, a Division of Simon & Schuster, Inc. Printed by permission.